That is how much time has passed between the events of Lucifer’s first season finale and “Everything’s Coming Up Lucifer,” the season two premiere. Two days isn’t a lot of time, but you’d almost be fooled by how much the Lucifer characters try to trick themselves into thinking that it is. In these two days, Lucifer and Amenadiel have compiled and exhausted a list of possible vessels for their newly-released-from-Hell mother, Maze has gone completely off the grid, Chloe has a means to finally figure out what Lucifer’s deal is, and Dan has already completed what should have been a career-threatening suspension. It would almost be funny that the show is squeezing so much into a small amount of time if not for the fact that the premiere is obviously preparing for the show to squeeze even more into the span of its sophomore season. “Everything’s Coming Up Lucifer” is an exposition-heavy episode for Lucifer, but it sort of has to be: It’s effectively a soft reboot of a good portion of the series’ premise. Last season, Lucifer was very much about proverbial “daddy issues” and Lucifer’s own attempts to discover who he is in the world; this season now brings his “mommy issues” to the forefront, paired with his dying promise of finally being the son his father always wanted. Now, with his mother begging for his help instead of seeking revenge, Lucifer is stuck in the middle of his parents’ fight, which is a lot different from being the rebellious child. And while it is the second season premiere, “Everything’s Coming Up Lucifer” works just as well as an introduction to the series—right down to the previouslies—as the first season as a whole. It’s an episode where anyone unfamiliar with the show can jump in without any big questions. So while there is definitely a mountain of exposition in this episode, it’s ultimately acceptable and a necessary hurdle to jump. It’s also an episode that has a lot to prove, after last season’s big ending. As has become somewhat of the norm for Lucifer, the case-of-the-week in “Everything’s Coming Up Lucifer” isn’t anything special, even though it does tap into one of the show’s more winning procedural aspects in the seedy, yet glamorous, Hollywood lifestyle. There’s something almost admirable about Lucifer’s commitment to very basic cases-of-the-week (with rarely a twist for twist’s sake), but at the same time, it’s still something that can slow down an episode’s momentum. However, this episode is smart in its decision to make sure the case appears to have a tangential relationship to the main story, at least in Lucifer’s mind. So even though it’s not actually a revenge plot by Momma Morningstar, Lucifer’s belief that it is allows genuine introspection to come from it, as well as an investment in the case simply because of how much Lucifer himself is invested. Because as much as Lucifer’s detachment from the cases outside of a punishment standpoint makes sense, it can often lead to the same detachment from the audience. Plus, there are a few genuinely funny moments to come from it—Amy (Skins’ Jessica Sula) jumping Lucifer’s bones when he thinks she’s his mom, Lucifer at the AA meeting (“Hello, my name is Lucifer Morningstar and I… LOVE drugs!”), Chloe busting the Devil drug dealer, Maze/Lucifer’s bonding time over a hostage—which make it all worth it. Lucifer is a really good show for moments, in general. That’s why the opening scene with Lucifer and Amenadiel teaming up to stop a jewel heist/find their mother is such a good way to start the season: It’s a moment that shows just how far the show has come, even this early in the series’ run. Also, with “Everything’s Coming Up Lucifer,” Lucifer appears to be doubling down on the metaphors when it comes to the divine, dysfunctional family situation at the forefront, even though Chloe may be getting closer to actually discovering the “truth” about it all. Suspension of disbelief allows the audience to accept the very premise of Lucifer being “real” and more or less that he decides to spend his time working with the LAPD. It’s not as though the show begs the question of whether or not he’s telling the truth (for example: either version of Cupid). So because of that general acceptance from the very beginning, Lucifer’s first season made Chloe’s refusal to believe Lucifer’s backstory a frustrating part of the show. Obviously, Lucifer’s invulnerability failing in Chloe’s presence made it easier for her to refuse to believe her nutty partner, but as things progressed, Chloe remaining in the dark (much like Dr. Linda) became more and more of a questionable concept. The question became one of: “What does the show have to lose by having Chloe accept the reality of the situation?” So here, the fact that she does not believe Amenadiel’s too perfect explanation (and seriously, bravo to the show for said explanation) of Lucifer’s entire “thing” actually does wonders for the character, as blindly accepting the easy truth would be a step back for her. This direction—with her also being too afraid, for lack of a better term, to test Lucifer’s blood—feels like the show will bite the bullet on her fully accepting the truth, sooner rather than later. The fact that she accepts Lucifer is a good partner regardless also helps. But if nothing else, “Everything’s Coming Up Lucifer” starts the season off on a good note by showing that it finally knows how to make Dr. Linda truly fit the show in the grander scheme of things. The first best step is in the show getting far away from the Lucifer/Linda sexual relationship, which honestly wore out its welcome past the pilot. And despite the fact that Dr. Linda still has discussions with Lucifer under the belief that he’s talking heavily in metaphors, this episode truly makes it feel like they’re on equal footing, with her not wanting to deal with his intentionally oblivious approach to his problems and him taking her frustration seriously. Plus, the fact that Dr. Linda actually did take Maze up on her friendship offer back in last season’s “Pops” finally gives the character a true existence in this show outside of her office and in the long run. 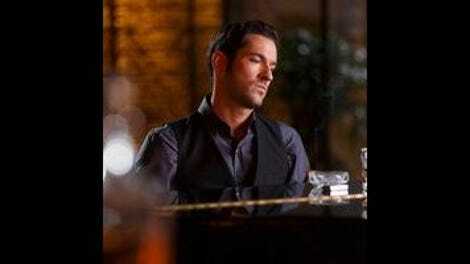 Honestly, it’s just good to have Lucifer back. 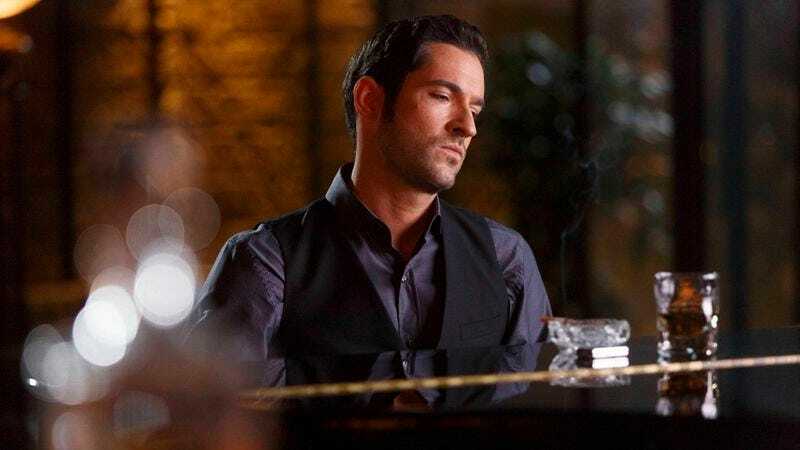 Tom Ellis’ performance as the literal charming devil remains a pitch perfect bit in the charmingly imperfect series, and with just this one episode, all the memories of the series’ endless potential come flooding back. You see, Lucifer often feels like a show that knows what it needs to do to achieve its full potential, but the mandatory wait for it to do so can often be a stressful one. As much as “Everything’s Coming Up Lucifer” has to do the expository tango to set up all the upcoming pieces, it really is a step in the right direction. Ellis sells what could honestly sound like petulant—and to be fair, Lucifer is often intentionally petulant—whining about his family and turns it into real emotional gravitas. Ella (Aimee Garcia) says it best (until she doublethinks her logic) when she says she thinks “the Devil gets a bad rap,” as that’s essentially the story Lucifer is telling. His father banished him from his home, his mother did nothing to stop that, and then when his father got tired of his mother, he did the same thing to her and made Lucifer keep her captive. That’s not even including Amenadiel’s role in things, as he apparently stayed on their father’s “side” during all of this. It’s a fascinating dysfunctional family saga—like the Bible itself, honestly, even if Lucifer has its own mythology—and outside of the campier aspects of the show, the idea of Lucifer tapping deeper into its mythology is one of the biggest reasons to watch the show. Obviously, the cast is a good reason too, but the fact that the show is such a work in progress (just like Lucifer) is why it’s really a show to watch. We are back for season two coverage of Lucifer, y’all. Thanks for reading last season. It’s moments like Lucifer’s unsubtle joke about Chloe’s past life as an actress that makes me think, if not for the accent, Lucifer would basically be a Geoff Stults character. I’m not saying that’s bad, but imagine the difference. I can’t decide if the show is actually trying to send a message or if it’s just going for a convenient way to move past a plot (especially with that soft reboot aspect) when it comes to the Dan “suspension” thing, but… The LAPD didn’t want the bad press, so they simply demoted him and tapped him on the wrist for improperly checking out evidence? This is where the suspension of disbelief thing makes it fine there are angels and demons but then drives me crazy when the parts that are grounded in reality don’t add up. There were dirty cops in their precinct! People died! Chloe’s career also suffered because of Palmetto. I know I said I’d be happy to never hear the word “Palmetto” again, but I think I got mental whiplash trying to figure this one out. Ella’s very quirky right off the bat, and I think I know more about her (she had a friend named Adolf, just moved from Detroit, and has four brothers) than any character who’s been on the show since day one, just from this episode. I kid, but hopefully this will level off as the season progresses, because the concept of a human character with faith (and one who is accepting, not judgmental) in the crew is actually a good choice for the show. Bless the show for not stretching out Maze’s absence any longer than this episode. Also, bless the show for having Lesley-Ann Brandt (and Aimee Garcia) sing the Leave It To Leslie theme. Hey, it makes Maze laugh! Also, that’s right: Maze now has two friends. Trixie and Dr. Linda. That doesn’t really explain where she was for those two days though, right? If it does and she really just bailed, “Everything’s Coming Up Lucifer” sure knows how to easily close up a plot point, now doesn’t it? Amenadiel’s slow-motion powers are now on the fritz. Earth is turning you boys soft, I swear. Lucifer’s kind of perfect sense of humor continues the moment “All Along The Watchtower” starts playing—at that moment, I found myself counting down to the actual introduction of Momma Morningstar, played by Battlestar Galactica’s Tricia Helfer.